From one album to the next, Nektar in the 1970s explored a variety of musical directions, while always be recognizably Nektar. The band were difficult to categorize, at various times incorporating elements of Progressive Rock, Hard Rock, Psychedelia, and Space Rock. Still in the band today are founding members Roye Albrighton on guitar and vocals and Ron Howden on drums. Klaus Henatsch has played keyboards on recent albums and tours. And for the new album – Time Machine – American musician Billy Sherwood plays bass and engineered the album. Sherwood will be familiar to Progheads, having done a stint in Yes and worked with a laundry list of rock history titans. The album opens with A Better Way, which starts off like some of the heavier moments from A Tab In The Ocean or Remember The Future. But that’s not what this album is about. When the keyboards come in the music has a distinctly Prog Rock flavor, bringing to mind Kansas when the keys are most up front. But when the main song portion and vocals kick in, it’s classic song-oriented Nektar. I’ve always loved Roye Albrighton’s voice, and I’m glad to hear it’s as soulful as ever. At around the 6 minute mark the music calms and we hear a pleasant acoustic guitar led segment that’s got a really nice spacey-jazzy feel, with spoken word by Roye, before launching into a heavy rocking finale. Tranquility is an accessible Prog infused song with some of the most complex instrumentation on the album. Destiny, Mocking The Moon, and Talk To Me are all nice melodic songs and all have tasty guitar licks, my favorite being the BEAUTY of a solo on Talk To Me. Set Me Free, Amigo goes off in a strange direction, being a Mariachi flavored light rocker. Interesting… not sure what to make of this one. Among my favorites is If Only I Could, which consists of accessible Prog Rock that shifts gears in interesting ways throughout its 10 minute length. I like the way the lighter sections interweave with the heavier guitar rocking. The whole piece is beautifully composed and arranged, with excellent playing from all. Ditto for the title track, a solid melodic rocker with swoon inducing guitar solos and killer rocking guitar and organ segments. Juggernaut is a Prog-Jazz instrumental with classic 70s Fusion styled keys from Klaus and killer guitar from Roye that’s jazzy at times and reminds me of Steve Hackett at others. Finally, Diamond Eyes has some of the dreamiest, exploratory, though still tightly composed, music of the set. 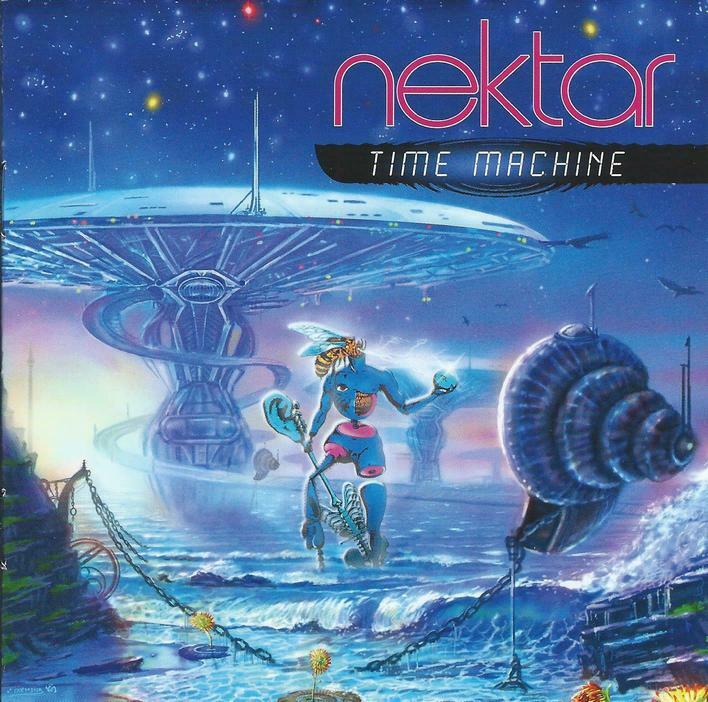 In summary, Time Machine is very much about the SONG, and includes some of the most overtly Progressive Rock oriented music I’ve heard from Nektar. Great compositions, arrangements and musicianship throughout. I should add that Nektar are still a hot live band. I saw them just last month on their U.S. tour, and crappy sound in the venue notwithstanding, they played great. And, to their credit, despite the tiny crowd, Nektar gave it their all and seemed to be genuinely enjoying themselves.